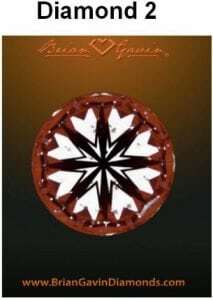 Brian Gavin Hearts and Arrows Diamonds Review - How Well Do They Really Perform? 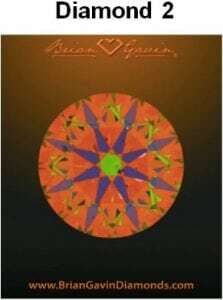 We talked about how Brian Gavin came to be the icon that he is in my overview of Brian Gavin Diamonds. 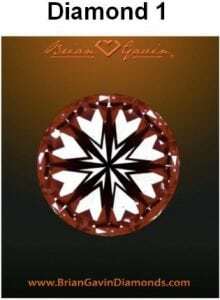 His reputation is set in stone in the industry as his astonishing perfectionism for the faultless diamond cut urged him to pioneer the legendary (H&A) hearts and arrows diamonds! 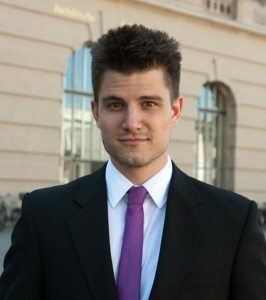 To give you deeper context, back in 2004, Brian Gavin presented a formal paper at the 1st International Diamond Cut Conference in Moscow and explained how H&A diamonds should be graded. Major grading labs and industry peers approved and endorsed this new hearts and arrows criteria. 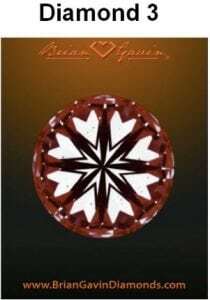 He proudly claims that his signature hearts and arrows diamonds are optically balanced for maximum visual performance and are the best of the best. But with newcomers battling to wear this heavyweight belt, can Brian Gavin live up to his promise of cut perfection? Or have other brands surpassed his gold standards? Let’s have a look! 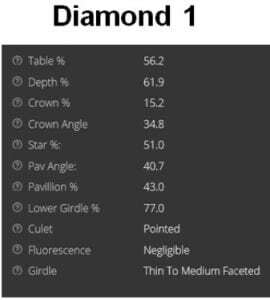 Now, the suggested proportions for Super Ideal diamonds are already very strict, and in fact, they are even stricter than GIA and AGS’s standards in grading a diamond with the best cut. What’s striking is that all the diamonds above match the Super Ideal proportions without a slight variance! Please be aware that AGS uses the terminology “pointed” for a culet whereas GIA uses “none.” It is the same, and it means that the culet is a finely sharpened point and not a flat surface. Otherwise, the culet could appear to be an inclusion. Diamond 2 has a small inclusion as this is a SI1 graded diamond. 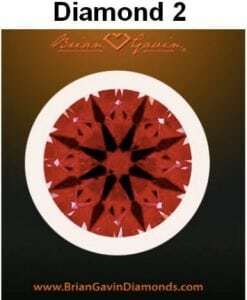 However, Brian Gavin only chooses such diamonds among their signature hearts and arrows diamonds that are eye-clean. Therefore, it’s a better idea to select a lower clarity grade as it will be much cheaper and surely eye-clean! What you are mostly looking for in an ASET image is lots of red/orange because this is where light is returned to the viewer’s eye. The blue color just adds contrast while the green color is for areas that are less bright or where the light is coming from the environment. 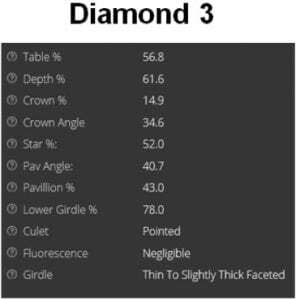 It’s normal to have some green areas on the verge of the diamond. The green dot in the middle is caused by the reflection of the table facet on the pavilion facets. But the color that you don’t want to see is the white color because it symbolizes light leakage. Now, the second diamond does have tiny whiter spots near some blue pavilions. This means that there is very little light leaking through the diamond. To be honest, it would be exaggerated to call it real light leakage, but the ASET image, in this case, would show you that diamond 2 doesn’t perform as good as diamonds 1 and 3. 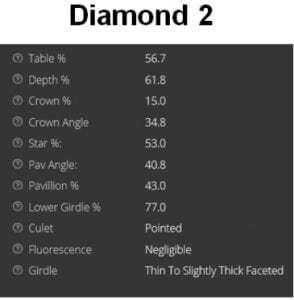 All in all, the Idealscope and ASET images provided by Brian Gavin make it fairly easy for you to choose a diamond with superior light performance. 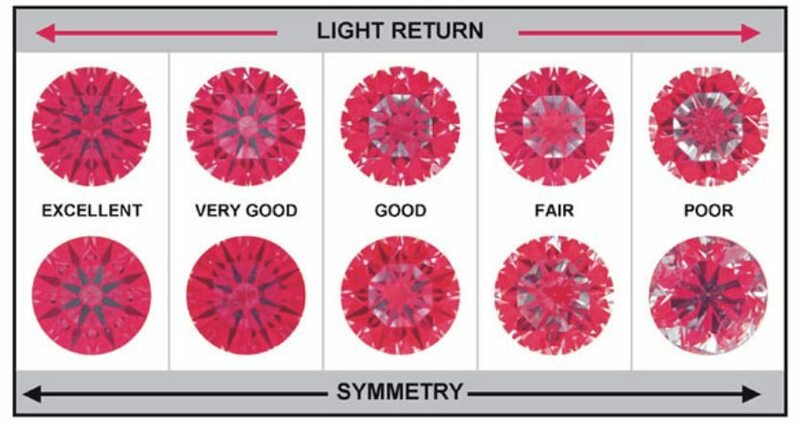 Furthermore, you can compare different diamonds with the top-notch light performance to each other to truly choose the best diamond possible. In my post about hearts and arrows diamonds, I described how you could distinguish between near and true hearts and arrows diamonds. And with the images above, I can say, without a doubt, that these 3 diamonds are all true hearts and arrows. The symmetry of the H&A patterning is flawless! 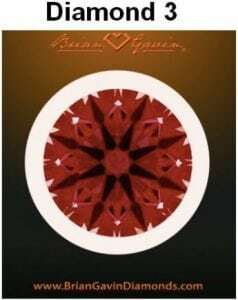 Having chosen three random diamonds within the Brian Gavin Diamonds signature hearts and arrows series, I got three outstanding hearts and arrows diamonds. 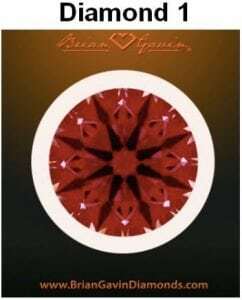 Brian Gavin is the real deal if you’re keen on owning the highest quality, but more importantly, true hearts and arrows diamonds. And you don’t have to go an extra mile to find out what’s true since Brian Gavin is able to provide Idealscope, ASET, hearts-and-arrows-viewer images, and impeccable customer service to point you to the right direction. 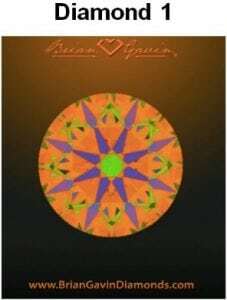 Go and check out Brian Gavin and their hearts and arrows diamonds for yourself. Flip through their Little Black Book while you’re at it. It’s also a must-see! 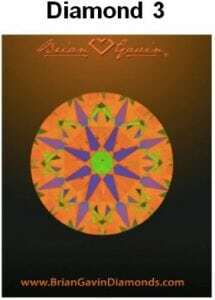 On the next page, I will have a close look at Brian Gavin Blue Diamonds. Read on to learn more!